The Whitehall Large Country Bell with Buck adds a stately presence to your indoor or outdoor décor. Whether you choose to ring this bell in celebration, to round up the crew, or intend to use the bell solely for decoration, this instrument is a quality work of craftsmanship. A majestic deer, frozen in mid-leap above a tree stump and fall foliage, decorates this lovely piece. The bell is handcrafted from recycled aluminum for years of durability, and scrolling details add beauty. Use the leather cord fastened to the 3" long clapper to sound the bell and let the ring resonate across your yard. The bell is attached to a 13" long arm and screws into posts, walls, or trees. 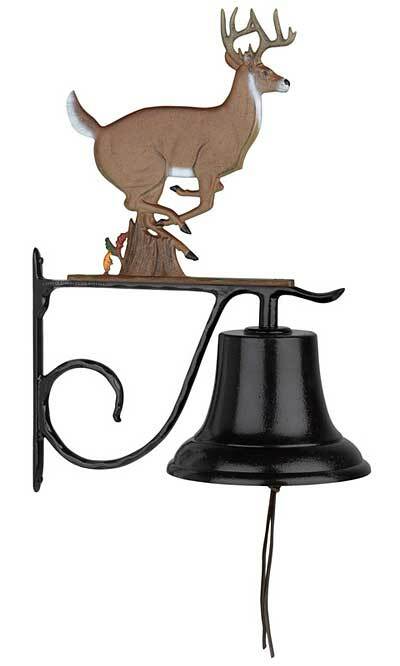 Include the charm of the Large Country Bell with Buck in your home, patio, or garden. Made in the USA.